"Uses Less Space With More Scenery"
N scale model railroad layouts are growing in popularity with model railroaders. 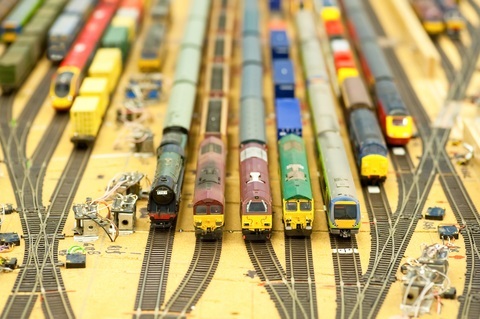 N scale (known in the UK as N gauge) model railroads have the advantage of taking up less space than the popular HO scale model railroad layouts. model trains. 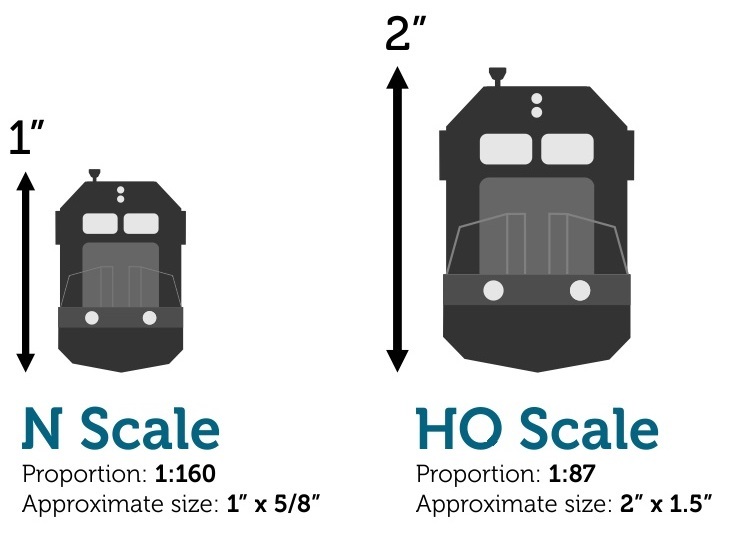 This means that you can build an N scale model railroad layout in an area about 30% of that area needed to build a similar model railroad layout in HO scale. With N scale model railroads a three-foot wide layout could accommodate up to a 213 scale foot radius. Being smaller, N Scale railroads allow for greater amounts of scenery to be created than would be possible on a similar HO layout. The smaller N scale railroad layouts are also more accommodating to larger quantities of cars in a train. So, if you like the idea of long trains going through towering landscape, then an N scale model railroad layout might be what you are looking for. As the name implies, the Win N Trak Model Railway Group focus on the hobby of model railroading in N scale (1 /160). This Winnipeg (Canada) based model railroad club uses the international modular layout concept developed by "NTRAK". The NTRAK concept employs standard track locations in order to allow modules built by members to be joined together to create model railroad layouts of various sizes and shapes. Win N Trak owns several of the key components, such as the "yard", power sources, and throttles. The yard is an important part of each setup as it allows members to put together and store their trains between runs on the layout. 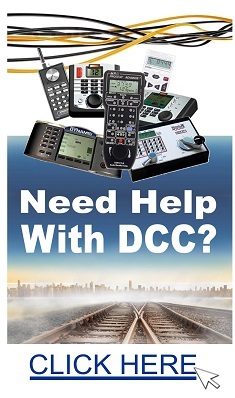 The model railroad layout takes from 2 to three hours to assemble, including the matching and connecting of the modules, the electrical components, and the cleaning and testing of the completed setup. Teardown, at the end of each show, takes up to one hour. Fort Bend County, Texas, has been a hot bed of railroad activity for more than 150 years. These days a suburb of Houston, Fort Bend County is crossed by some of the most active rail lines in the US, including the former-SP "Sunset Route". Living in various communities in this area, the members of the Fort Bend Model Railroad Club are blessed both with the opportunity to see a lot of full-size trains in action, and to model railroads in N scale indoors as a way to seek relief from those long hot coastal Texas summer days. The N scale model railroad club has a large NTRAK layout composed on many modules, tied together by the theme of railroading in Fort Bend County in 1951. When all the modules are used, the layout is about 40 ft. x 24 ft. in size, with a center island with 9 12 ft. track used for staging.